What difference do you think it would make if it Rheumatoid Disease were recognized for what it is by everyone – the general public, media and marketers, pharmaceutical companies, U.S. National Institutes of Health, the Centers for Disease Control and Prevention, the American College of Rheumatology, all healthcare professionals, your neighbors and your family…? WHAT WOULD RHEUMATOID DISEASE AWARENESS MEAN TO YOU? Share your answer in the comments box. Share this blog post on social media, along with your answer. Email this post to a friend, adding your comment (button below). Write a blog post about WHAT RHEUMATOID AWARENESS WOULD MEAN on your own blog. If you have a blog of any kind, you are invited to write a brief post to answer the question What Would Rheumatoid Awareness Mean? Put a link to this post in your blog post, and add a comment below to tell others about your blog. Patients and their families, caregivers, as well as industry and healthcare professionals are welcome to participate. 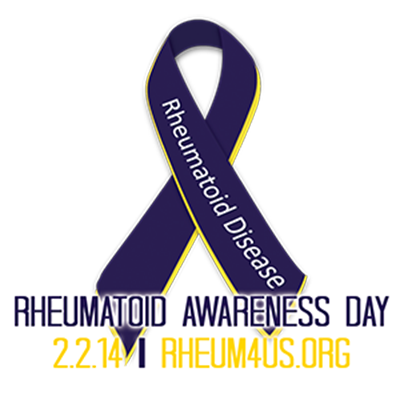 I hope we hear a variety of voices in honor of Rheumatoid Awareness Day. On January 31, I’ll post summaries of all the blog posts, with links so you can visit them all. 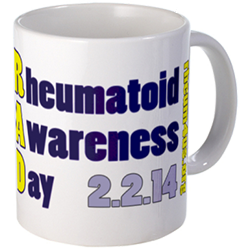 Click here for a list of 2014 Rheumatoid Awareness Day events on rheum4us.org. In 2013, people held local gatherings and fundraisers. Tens of thousands participated in live online events on social media. 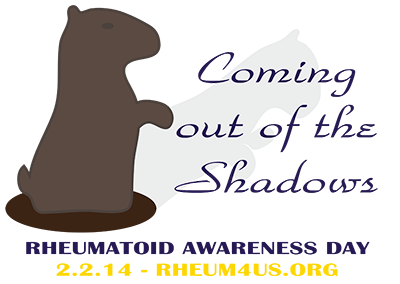 Others contacted local media or public officials for proclamations of Rheumatoid Awareness Day – click here for one story. Many donated to the Rheumatoid Patient Foundation (RPF). This year will bring another special matching grant for RPF donations, so you can contribute to that now if you’d like. If you do, I encourage you to share that with others too, since it might inspire them to get involved. Help spread awareness with a PBS NewsHour Twitter chat Thursday January 16 at 1pm EDT; I’ll be guest co-hosting. The hashtag to follow is #NewsHourChats. Get t-shirts or mugs, etc. to help spread awareness. Click to be counted by joining the Facebook event for Rheumatoid Awareness Day. Please feel free to save the images and use them in social media or your own website. There are other images available on rheum4us.org – click here. More institutional flexibility with respect to part time work, alternate assignments, etc. My boss and colleagues are great, but their hands are tied when it comes to changing work assignments. Related to this, more flexibility in SSDI to consider rheumatoid disease as a legitimate disability. Taking the word “arthritis” out of the description. People can confuse it with osteoarthritis or the normal wear & tear of joints. This disease should have the same exposure, research, etc. as cancer & diabetics. It can be fatal, which is scary for me. I have Rheumatoid Autoimmune Disease (RAD). Thank you Kelly for being our voice. Hugs!! – Separation – that we can be understood as a disease all its own, not one of the 100. Rad awareness would mean to me: more research money, plus we can do more ourselves. I have participated in two clinical trials. The first one 15 years ago was a huge benefit to me because I got to meet and get to know five other women w/rad. I didn’t feel so isolated and crazy. The second one was for orencia. It was a five year study and I now benefit myself from orencia infusions. I also plan to leave my body for medical research into rad. The other awareness I would like to see is that of friends and relatives be more understanding when I say I’m very tired, or can’t do as much as I did five years ago, when I was still working. That’s my personal big one and I’ll bet a lot of others too! Thank you, Kelley, for your spirit and determination. You are a blessing to us all! It would be great to be better understood by all involved in the treatment of the disease. It would also be great to have others understand that 1) it isn’t just my joints 2) it’s not all in my head 3) I cannot control the level of disease activity, though I do try to mitigate as much as possible. Even if it does not improve my case – which is actually not too bad – if awareness helps others, I will be thankful. First thanks for all the work you do! You were silent for a month and something told me you were not doing well. Rheumatoid Awareness to me would get people to stop saying its only arthritis, your lazy, you look fine and the pain is in your head why don’t you go to social functions or do anything recreationally anymore. Having had 5 spine 3 shoulder, elbow and knee surgeries you would think family and friends would get it. But they don’t. Chronic neck and back pain started when I was 19 and I was laughed at. At 53 years of age I’m still questioned constantly and occasionally mocked. When I could no longer perform the dutys of my 28 year career I’m considered a malcontent. Im repeatedly asked why can’t you work through the pain? It took until last summer to finally get a diagnosis. People medical practioners included don’t understand the fatigue and feeling sick combined with chronic pain is debilitating and that’s not throwing in the side effects of prednisone and methotrexate. Rheumatoid disease has cost me my career and if my long term disability insurance company does me dirty it will likely bankrupt me. Who would want a life life filled with surgery pain insurance company reviews and the expense of a lawyer if it were “only Arthritis”. Thank you Steve… I agree & I understand completely! I will keep you in my prayers. Wishing you a day of mental , emotional & physical contentment. Warmly Naomy. I’m Kara and was diagnosed with JRA when I was 6. I’m currently 22 and now have psoriatic systemic rheumatoid arthritis. I started a blog to help the kids/teens/twenty something’s who are going through this because I feel like there isn’t enough awareness out there. I would love for y’all to check out my blog and share it. I’d really like to get the word out that this disease affects everyone! It would mean no more comments such as, “Oh, my grandma had that”. I would hope they would become aware this is a lifelong disease with many consequences. I hope to see better funding for people who cant afford treatment. RAD is not a poor mans disease the costs are tremendous and they are life long. No cure makes it a life sentence. Even if you have Insurance most cover little of the cost of treatment. I would love the “Arthritis” to be dropped from the name, and more than anything, Awareness to me is people knowing about and understanding the realities of living with Rheumatoid Disease, particularly (for me) in University settings. I have phenomenal professors who listen with open ears and compassion, and my committee is incredible at working with me around RD, but the institution itself, particularly the office of Disability Services, has made my life harder than it needs to be on occasion. Here’s my blog response! Thank you for doing this, Kelly! Hi Kelly, In bring about more awareness to RD, hopefully many changes would occur. Comments such as “I use to have that”, “oh I have that, see the end of my little finger” or “let me see your hands, I don’t see anything wrong with them” or “it’s not that bad, at least you don’t have cancer” —hopefully some of these would stop. Also the cost of the disease is tremendous and some people aren’t even able to get the help they need because of the expense. RD is a life sentence and without help of the medicines, it is crippling, incapacitating and sometimes fatal. Your work has done so much and I’m amazed at how you can keep going (like the little energizer bunny) knowing how much pain you have to be in constantly. Also with the fatigue that goes with this disease. My prayers are with you daily and my appreciation always. You have helped me more than you can ever know and once again, I say a big thank you! To me, awareness would mean that wait times to visit rheumatologists would decrease, as more people would want to enter the field of rheumatology if they understood the potential severity of J/RA. More people would want to help. Awareness would also mean that kids wouldn’t be dismissed as easily as I was. People wouldn’t have this, “oh hush, you, you’re too young,” attitude. They would want to be accommodating, and treat these kids the way they would a kid with an illness that is perceived as legitimate. When my doctor informed my school that I was not to do gym, and was only to do the written side of P.E, they didn’t notify the TEACHER- the teacher told me that if I didn’t attempt the physical stuff, I wouldn’t get my credit. Because I tried, they had to drain 200cc of fluid off of my knee. If people weren’t so dismissive, people wouldn’t have to deal with ridiculous crap like that. Awareness would mean people would stop comparing my illness to an elderly person’s ailment or an inconvenience. Awareness would mean that research was more reasonably funded. Awareness would mean people understood when I note my disease the same way they would be understanding to someone with a more known, comparable illness. 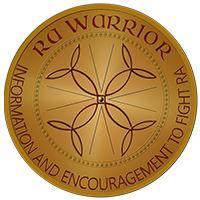 What would RA awareness mean to me? A less painful life for me and also to keep other RA patients from going through what I have been through. Praying for a cure in our future…. Awareness would mean no more comments from well-meaning friends and acquaintances who say things like “Aren’t you over that yet” or ” Aren’t you taking anything for your arthritis? I saw something on TV that will help”. I have had ra my entire adult life. I have been challenged every day 24 7 and yet people and family still do not understand the social,physical,emotional and spiritual impacts. I am 58 now and severely disabled but I have had a career and live a blessed life be cause I never played the victim and I hid my pain for years even with family and my corporate life. My frustration is my fault and yet if I had the validation in the media it would so help me feel supported as I do not. I still wake up every day not knowing what I will be dealing with and after 30 years all has built up to wanting to scream and say DO YOU REALIZE WHAT WE ARE GOING THROUGH? HELP US ………BE KIND UNTIL THERE IS A CURE! WE ARE SCARED EVERY DAY….the truth of the disease is a secret in this world. I echo the comments of many of those who wrote in this blog. The word arthritis puts a certain connotation in people’s minds that really doesn’t describe what RD encompasses – at least for me. Many of my symptoms are invisible to others. For example, I take monthly infusions of a biologic medication. At any given time there are people in the infusion room with visible RD effects and those with little or no outward signs like myself. After every day of relatively normal activity, going grocery shopping, working a one-evening per week part-time job, etc., I would rather not spend most of the next day recuperating. It is very frustrating not to be able to live the life you want. I’m recently retired and hoped to have a part-time job. I’m not sure now I could handle more than my one day evening job. I was diagnosed with RD within the last 6 years but I’m now aware that I’ve had signs of it for many years in my jaw, hips, and feet. The finger joints came later. In my state there are only two cities with Rheumatology clinics. The closest is 70 miles. The other, 140 miles. I applaud the efforts of this group to form a foundation for Rheumatoid Disease. Awareness begins here. I joined last week. I think it’s imperative to take “arthritis” out of the name. My sister-in-law has RA (or RD, since we’re changing the name, right? ), and until we found out about her diagnosis, I thought it was different from osteo, but didn’t know it was a systemic issue. Now I do, and am confused as to why, after years of knowing it’s an autoimmune disease, we are still naming it after just one of several symptoms. 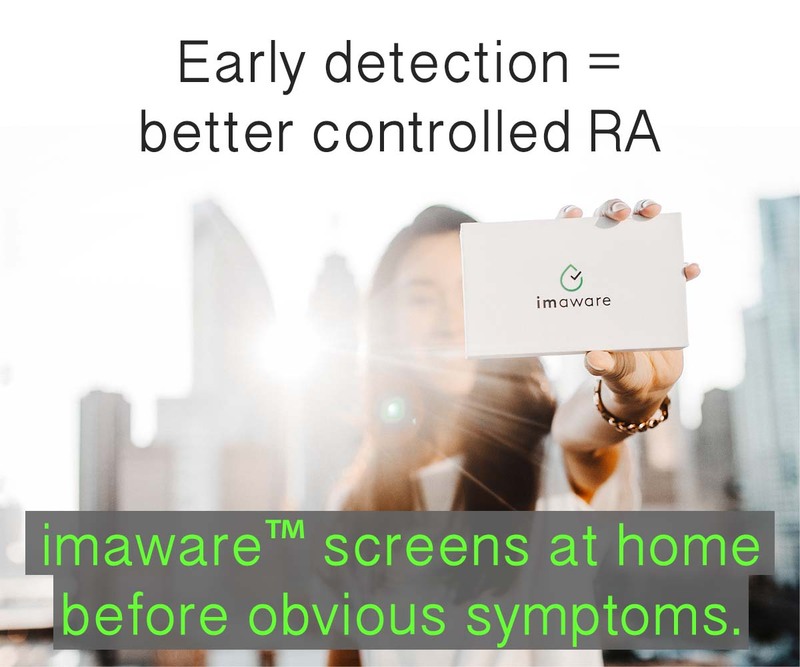 For there to be awareness that RA IS NOT ARTHRITIS, would be huge. You put that word in there, and anyone older than you typically says: “oh yes, I have that in my …..neck” for example. No one understands that thus disease attacks your entire body. This is a Systemic disease that is causing is much suffering and dibilitating people. We need to raise more Awaremeness for more FUNDING to find a cure..because for me, methotrexate caused vulvar cancer, so I can’t take that….not one biological worked….Finally we are trying Zeljanz…..need a couple if months to see if it helps.. There are so many FACES of RA..and we all look different…. We need to know how to teach not only the non-RAers but the people with RA. Thank God for Kelly and people like her. It is so helpful to have a place where we can communicate with out someone judging this disease or uszeal.. This disease needs all the exposure it can get. I think there is so little known about itand there is not enough research being done. I know it took them a long time for me to be diagnosed. The Doctors miss this and I thought I had Osteoarthritis and walked around in pain for a long time. Rheumatoid Awareness means that others don’t look at me and wonder why I am using a cane or why I participate in very few activities after 5 p.m. or why I need to use a handicapped parking space sometimes. Knowledge would help those of us who struggle so hard to afford a level of dignity with others who just don’t understand. Rheumatoid is not arthritis….This is so difficult to explain to people. The random pain that radiates in our body is unexplainable to your most trusted friend. I want people to know that we need more specialist. A bit of competition in this area of medicine would benefit all of us. I believe in placing trust in our youth and things will change…so all those young people planning on going to med school, think of studying Rheumatology. Remember that one person can make a difference. It would mean that I wouldn’t have to explain my disease to anyone anymore. People would be fully aware of what we are up against. RD awareness would mean that I wouldn’t be treated like I am fine when I am not. It would mean that my limits would be recognized and if I needed help because of pain or weakness, it wouldn’t bring eye rolls and judgement,instead of understanding and compassion. RD awareness would also mean that this disease would be recognized for what it is…a killer. It just kills more slowly and painfully than Cancer and Heart Disease, which isn’t uncommon to end up with along with the RD. I agree with you so wholeheartedly Lisa. It’s not about sympathy, but understanding. It only piles insult upon pain when limits are not recognized, and we receive cruel judgment when we are trying hard & doing the best we can. First, Kelly thanks for all you do. There are no words. RA Awareness helps fund research for a cure and new meds. It would help with the “crazy” stigma when “we don’t look sick”. This issue breaks up families, loses people jobs, and makes us feel worse. I think it might help providers of disability understand sometimes we really can no longer work and need to be able to collect monies we have worked hard to pay in. Might help reduce depression and anxiety for those newly diagnosed and scared to death by shedding light on the positive developments. In short, it’s just about time everyone was aware of a disease that has crippled and stolen so much from so many! I wrote a blog for this called Brave New World of Awareness http://theseatedview.blogspot.ca/2014/01/brave-new-world-of-awareness.html. It’s a piece of speculative fiction about what the experience of being diagnosed with RA/RD might look like if there were more awareness about the disease. can’t wait to read! thanks for posting! Thanks for inviting me to write about this important topic. I’ve had RA/RD for 12 years now since the birth of my first son. 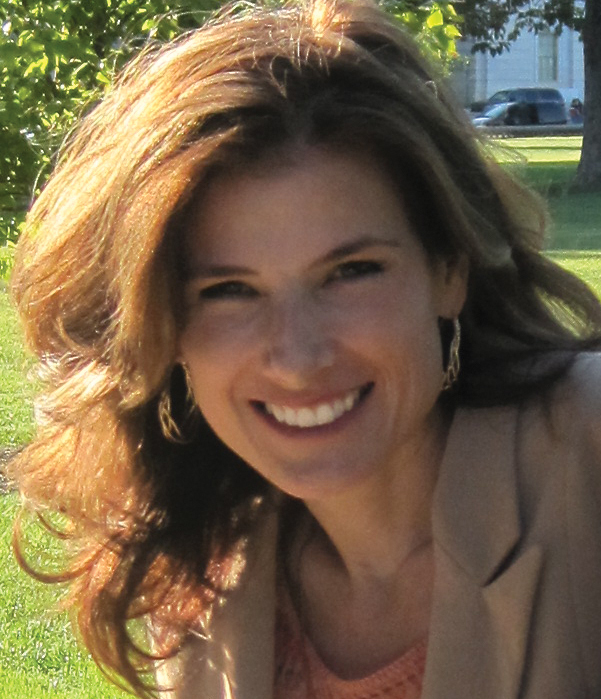 It’s made the job of being a mom to 3 healthy, active boys even more difficult. I try to cope with my disease in a positive way, I am still thankful it’s me that endures this and not my children or loved ones. But it can be difficult to not have people in person to discuss it with. I am thankful for your site and community where we can support one another. I hope raising awareness will help find better options or maybe even a cure in my kids’ lifetime. A mom can dream, right? Hi Kelly, here is my post for the blog Carnival. Thanks for doing this! Here’s my post for the blog carnival. Great topic, was good to write this out. Here is the link to my Blog Carnival post. Thank you so much for hosting this! I am a newbie when it comes to blogging but I found my way over here from the FB event. It’s hard to be creative when all you can think about is pain. As a writer with eventual aspirations of being published, stopping my creativity is something I don’t want to do. If it will help more people to understand, I am more than happy to share. I really liked your blog post for RD Awareness, especially the beginning with Our Lady of Sorrows. It took me right back to my school years. That undiagnosed feeling is so bad. You know something is really wrong and no one believes it. On top of that you’re so sick just living is hard let alone planning a solution. I’m pleased to add my post to the Blog Carnival – What Would Rheumatoid Awareness Mean to Me. Thanks to all the voices and insights that are coming together for Feb 2nd to bring awareness. I’ve joined the blog carnival, too! What would RA awareness mean to me? It would mean that people would understand the difficulties that I face. They would have a better understanding of what exactly I go through on a given day. People can not see the pain that a person with RA has therefore they do not think that the person has a disability. If more research and a cure for RA was available, I would be able to live a pain free life and be able to work again.